Designing a bathroom is a very creative process, primarily due to the fact that there are numerous ways to accomplish it. Do you have home remodel ideas for your bathroom? Most homeowners dream of a bathroom with the latest amenities such as a deluxe whirlpool tub, aromatherapy system and separate his-and-hers vanities. Unfortunately, most homeowners do not have the space (or perhaps the money) to realize their dream of that "perfect bathroom"; however there are many home remodel ideas that don't necessarily require big bucks and a big room. Home remodel ideas for the bathroom do not have to coast you big bucks—unless you're going to do a major overhaul. If that is the case, then consult with several contractors that specialize in bathroom remodeling. Make certain that the contractor you select is licensed and has good references. 1) Get a new showerhead. Sounds simple, but it can make a big difference in your morning shower: consider changing your current showerhead to a new unit that offers unique spray and massaging patterns. 2) The greater percentage of homes have a combination tub and shower in their master bath—not necessarily by choice, but by space limitations. To freshen up its look, try a new shower curtain or even adding shower doors. Shower curtains of all designs, colors and materials are available at local department and home stores and on the internet. Some of the latest shower curtains even have convenient pockets to keep lotions, loofas and all your showering accessories right at your fingertips. And for a more upscale design, try hinged or sliding shower doors that secure to the top of the tub. Choose from clear, smoked or etched glass to complement the décor of your room. 3) This is one of the easiest and, perhaps most dramatic home remodel ideas for your bathroom. To make the most of a small area, consider adding a new, single vanity. Today's latest styles extend the "furniture" look of the master bedroom into the bath with decorative feet accents, crown molding and framed mirrors. This cabinetry also provides specialized storage spaces such as linen towers and vanity drawers. For a money-saving idea, refinish your old vanity - changing from a dark wood to a lighter finish. 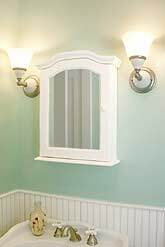 Or, simply paint the front panels and add hardware to create a new look. You'll see a big difference. 4) The latest bathroom styles call for simple, wood-framed mirrors instead of medicine cabinets above the sink. These mirrors are inexpensive and come in a wide variety of wood finishes. If you see a picture frame you like, you can have the glass replaced with a mirror. Or, if you still prefer the storage space that a traditional medicine cabinet offers, visit your local home center or hardware store to see what's new in styles. Replacing a rusty or outdated medicine cabinet with a new design can dramatically change the look of your bathroom. 5) Replacing the faucet is also an easy and inexpensive way to upgrade the bath. Generally, if you're handy, you can do this job yourself. There are many new styles and finishes available. You don't have to go with the traditional chrome look. 6) One of the simplest home remodel ideas for your bathroom is to change the accessories. Carry the same theme throughout the entire bath. Accessories manufacturers offer towel bars, robe hooks, toilet paper holders, soap dishes, toothbrush holders and more to provide a customized look in the bath. Although chrome is still the most popular bath accessory finish, consumers now have a number of other choices including oil-rubbed bronze, wrought iron and wood. In addition, accessories can be found to match every decorating style from country to traditional to casual or contemporary. The key is that the latest collections have new, innovative designs to take decorating to the next level and add another dimension in the bath. 7) For added storage space, or to display collectibles, consider adding a glass shelf in the bath. This shelf allows you to display items that are reflective of your personality and design style. This shelf can also be used as added storage space for toiletries. 8) Lighting is one of the most important considerations when you're reviewing your home remodel ideas for your bathroom. If your current bathroom has a lighting fixture that could use an update, you will be amazed at the range of styles and finishes currently on the market - from the clean look of polished brass to the retro look of brushed nickel. Not only is the fixture important, but so is the light it contains. In the bathroom, you need proper lighting to put on makeup, accessorize or shave. Brighten up your room with compact fluorescents. Fluorescents have come a long way in recent years - they offer color similar to incandescents and light immediately without flickering. And, these bulbs can last up to seven years, saving between $26 to $86 in energy costs over the life of each bulb. It is recommended that you have a licensed electrician complete the job unless you really know what you're doing. 9) Painting is a simple makeover, especially in a small room such as the bath. Go with a clean look with a shade of white such as ecru, oyster, almond or beige. These neutral tones will make a small bathroom appear larger. Or, for a dramatic flair, choose darker colors in bold blues, greens and reds. If you want to go beyond just painting, accent the room with a colorful or unique border. This might be just the thing to bring out the personality of the room. No longer do these borders need to be at the top of the wall, mix it up a little by putting a border at waist height or even eye level. 10) If you choose a neutral color for the walls, add livelier touches with brightly colored towels, soaps, candles and artwork. Take some of these home remodel ideas for your bathroom and, voila! A whole new look!